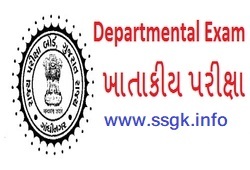 SEB: State Examination Board Has Published Notification for Departmental (Khatakiy) Exam. Eligible candidates can apply online via official website www.sebexam.org. Detailed information is given below. How to Apply: Eligible candidates can apply online through official site www.sebexam.org. Khatakiy Exam Kon Aapi Sake? (1) Khatakiy exam High School na Madadnish teacher ane High school na madadnish shixan nirixak aapi sake. (2) Panchayat savarg na madadnish jilla nirixak, Shixan na vistaran adhikari ane kelavni nirixak class -3 vala aapi sake. (3) Prathmik na shixako aa exam aapi sake nahi.